Seeking a secure peace with freedom and justice, built on global citizenship and effective global governance. The world’s leaders say nuclear terrorism is the greatest threat we face—with good reason. Even if there’s little chance of it, the explosion of one crude nuclear bomb in one major city would change the world forever. Not only could it cause death on a mass scale, but it could also trigger global economic disruption, environmental degradation, and a wider conflict requiring a military response. There has been a serious effort to scoop up and lock down the world’s nuclear materials since the end of the Cold War. Yet nearly 20 years later, we are far from having all of these radioactive materials secure. And we are at risk of them falling into the wrong hands. Only a global cooperative effort can prevent this. 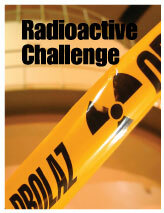 Radioactive Challenge helps viewers examine the challenge of securing all vulnerable nuclear materials globally. It aims to encourage discussion of the complexities of the “world’s greatest security challenge,” keeping nuclear material out of the hands of terrorists. With event planner and moderator guides chock-full of helpful tips and resources, the toolkit has everything needed to put together a successful event. Discussion guides are provided to facilitate group discussion on the issues raised in the video. Also, the toolkit includes materials that provide further background on the discussion topics. "Courier: Radioactive Challenge"–a publication produced by the Stanley Foundation that includes articles on securing vulnerable nuclear material, Kazhakstan's rejection of nuclear weapons, and global cooperation on nuclear security. "Courier: Nuclear Risk"–a publication produced by the Stanley Foundation that includes articles on extension and expansion of the G-8 Global Partnership Against the Spread of Weapons and Materials of Mass Destruction, “dual-use” assistance to curb proliferation of WMDs and meet development needs, and testimony to Congress on the 2010 Nuclear Security Summit. “Global Lockdown: Moving the Needle on Nuclear Security”a policy analysis brief from the Stanley Foundation by Dr. Elizabeth Turpen, lead associate at Booz Allen Hamilton. "Talking about Nuclear Weapons with the Persuadable Middle"–a report from the U.S. in the World Initiative that includes communication advice designed to reach the mainstream American. International Panel on Fissile Materials (IPFM): The IPFM is an independent group of arms control and nonproliferation experts that analyze the technical basis for practical and achievable policy initiatives to secure, consolidate, and reduce stockpiles of highly enriched uranium and plutonium. The James Martin Center for Nonproliferation Studies (CNS): The CNS combats the spread of WMD by training the next generation of nonproliferation specialists and disseminating timely information and analysis. The Project on Managing the Atom (MTA): Based at the Belfer Center for Science and International Affairs, Harvard Kennedy School, MTA brings together scholars and practitioners who conduct policy-relevant research on key issues affecting the future of nuclear weapons, the nuclear nonproliferation regime, and nuclear energy—particularly where these futures intersect. Nuclear Threat Initiative (NTI): NTI’s mission is to strengthen global security by reducing the risk of use and preventing the spread of nuclear, biological, and chemical weapons and to work to build the trust, transparency, and security that are preconditions to the ultimate fulfillment of the Non-Proliferation Treaty’s goals and ambitions. Partnership for Global Security (PGS): PGS mounts a global effort to decrease the dangers posed by WMDs by working for a world in which all WMDs are secured and the threat of their use is eliminated. The Stanley Foundation: As a part of its work to promote public understanding, constructive dialogue, and cooperative action on critical international issues, the Stanley Foundation believes there is a clear need to move toward greater nuclear disarmament and better nonproliferation control, as well as preventing loose nuclear material from falling into the wrong hands. The Spring 2018 issue of Courier highlights some of the impact-driven activities the Stanley Foundation pursue with its partners. This includes stories that resulted from two journalism workshops: one examining the false missile alert in Hawaii, as well as one focused on issues of conflict and instability. This issue also examines how Green Banks could help bridge the climate finance gap, explores a new initiative that hopes to bring gender equity to the nuclear field, and brings you the stories of three teachers who enhanced their understanding of the world through travel. Spring 2018 PDF. Subscribe for Free. The Stanley Foundation convenes its Strategy for Peace Conference annually to consider key policy challenges, drawing on the experience and knowledge of invited experts from the public and private sectors. Concurrent roundtables focused on each of the foundation’s three current areas of programming—climate change, nuclear policy, and mass violence and atrocities, with a fourth roundtable focusing on global governance. These roundtable discussions are intended to generate group consensus recommendations for policy change and multilateral action. More. Our bimonthly newsletter is filled with resources to keep you up to date with our work at the Stanley Foundation. Each edition includes news about recent publications and stories as well as features our people and partners. You will also find many extras, from upcoming events to multimedia resources. Sign up for the latest to stay engaged on key global issues. As a part of our efforts to limit global warming to 1.5°C, the foundation put forward policy ideas to achieve a global turning point in emissions by 2020, built upon efforts to catalyze global climate action by countries and sub- and non-state actors, and worked with journalists to strengthen coverage of the UN climate negotiations. The Stanley Foundation publishes policy briefs, analytical articles, and reports on a number of international issues. To reduce our carbon footprint and cut waste, we almost exclusively, use electronic distribution for our publications. Sign up to receive our resources via e-mail.